Diameter: 7in. x 7/8in. (178mmx22mm), Max. Speed: 8,500 rpm, Max. 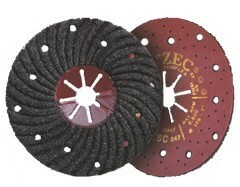 Peripheric Speed: 80 met./sec.o, Abrasive: Silicon Carbide ZECï¿½ was established in 1958, and has specialized in producing abrasive fiber and plastic backed discs to be fitted on grinding machines and grinding power tools. 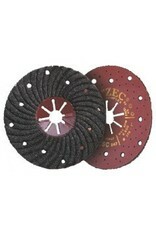 ZECï¿½ discs are perfect for a variety of grinding projects on a wide variety of materials. Please use power tools with caution. Disc Description: The Semiflexï¿½ disc is fiber 2.0mm in thickness topped with multiple layers of first-rate S/C (Silicon Carbide) abrasive. The Semiflexï¿½ is intended to be fitted on hand grinding machines with a proper backing pad. Backup Pad: The Semiflexï¿½ disc has a heavy duty fiber backing that requires a backup pad. Safety Compliance: ISO 9002 Approved, European Standard EN 13743 Usage: The Semiflexï¿½ fits most angle grinders and requires a proper backing pad. Comparison: In comparison to depressed center wheels or resin fiber discs the Semiflex is lighter, cuts faster, and grinds faster while leaving an even surface. The Semiflexï¿½ cuts faster than conventional grinding discs. Faster - Less time and labor to complete the grinding task. Loading - The Semiflexï¿½ disc design minimizes the loading of material being ground on the disc. The Semiflexï¿½ disc will continue to grind when conventional discs will fail due to loading. Cooler - The Semiflexï¿½ disc design includes holes in the disc that allows the disc to grind cooler by increasing air flow and grinding material ejection. Maintaining a cooler work surface and a cooler disc surface will maximize the life of the disc. Longer Life - The Semiflexï¿½ lasts up to 7-10 times longer than conventional aluminum oxide resin fiber discs. Multiple layers of grain, a spiral disc surface, and air cooling holes are all part of the Semiflexï¿½ disc design that gives it a longer lifespan compared to conventional discs. Backing Pad - The Semiflexï¿½ has a heavy duty fiber backing that requires a backup pad. The backup pad absorbs heat to keep the disc cooler. A backup pad will provide greater durability.